The true limitation now is not our technology or expertise, but our thinking. Technology, especially Internet of Things (IoT) technology, is making it possible to imagine services and markets that were not conceivable a few years ago. Even as recently as a decade ago, mobile network data speeds, smartphone market penetration, and GPS accuracy would not have allowed ride-hailing companies such as Lyft, Didi Chuxing, Ola, Grab, or Uber to exist in the fast, convenient way that has made them one of the bellwether categories of the sharing economy and some of the most disruptive companies in recent memory. Many revolutionary ideas perished on the vine because the technology to make them a reality did not exist. The material and digital things that make up IoT—small, light, cheap sensors that gather massive amounts of data and actuators that interact with the physical world, along with the machine learning that helps Amazon roll out new products and operates Google’s prototype self-driving cars—are relatively recent inventions that have permanently changed the game. (Interestingly, self-driving cars are technologically at the midpoint between car design and autonomy/mapping technology. It’s revealing that Google thought it easier to design a car than GM or Volkswagen thought it to develop self-driving technology.) In turn, they have been triggered in large part by competition in the smartphone industry—smartphones being the conductor’s batons of IoT. However, all these tools remain just tools, nothing more. The real game changer has been the vision they have empowered. All solutions, disruptions, and paradigm shifts begin with smart people asking better questions, caring about the answers, and envisioning a way that one part of the world can operate in a different, better fashion. In the past, the product-first philosophy limited our imaginations to the factories we could build, the energy sources we could harness, and the objects we could fabricate. No more. We are transitioning from a technology-defined world to a vision-defined world. In the IoT era, what a business can achieve depends more on visionary thinking—on “What if the market for that product or service worked this way?”—than on the availability of technology. No matter how audacious the idea, the odds are good that the solution, from natural language processing to machine intelligence to robotics, is already available or on the development fast track in places such as MIT, Google’s X research center, Carnegie Mellon University, Technion, or Shenzen. For the first time, whatever entrepreneurs can imagine can probably be done. For centuries, new markets have arisen slowly as products and customer needs evolved. One hundred years ago, if a business moved into a new market, ten or twenty competitors would be making the same move. Even in the last few decades, creating a new market for a product meant spending millions on advertising, marketing, and brand development. If a company launched something truly novel—digital presses to replace printers’ old offset presses—they had to shoulder their way past heavy skepticism. Today, it is possible to tap into a resource that has traditionally not even been viewed as a marketplace or center of economic activity and “marketize” it. The sharing economy, from Lyft to TaskRabbit, SnapGoods, and Roadie, is but one example. It came to pass because entrepreneurs perceived hidden economic value in peer-to-peer collaboration empowered by fast, intuitive, connected things. Companies no longer need to fend off competitors all trying to sell a different variation on the same product. With vision, insight, engineering and design skill, and a passion for disruption, anyone can be first. Those that do it will embrace a completely new business model: inversion. But what exactly is inversion? 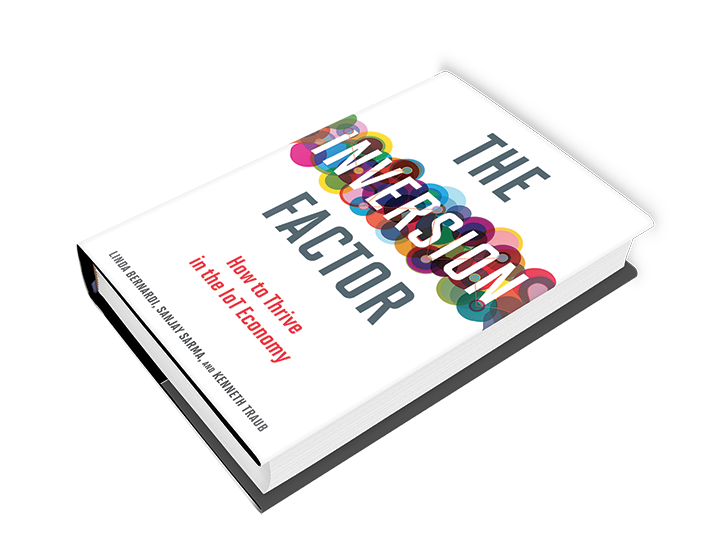 Inversion is a paradigm in which a business’s mission and core competence are defined needs-first, rather than product-first. Inversion is a strategic philosophy that delivers value not by launching a product and innovating around the product line, but by examining the customer need and innovating around the total experience, using products and technology in whatever way works best to meet that need more effectively and efficiently. We believe that inversion leads inexorably toward IoT. The large enterprises of the past, from automakers to builders, were founded on traditional business models that were not designed to respond to rapid change nor to offer their customers choice or flexibility. Create products that customers bought and used based on the predetermined palette of features and functions with which designers saw fit to equip them. Periodically modify their products, re-brand them, and sell them again. This product-first orientation built the world’s largest economies and companies, from GM to Procter and Gamble to Nike. But today it is a brake on innovation and growth. Such businesses are restricted to pursuing customer needs that can be satisfied within the boundaries of their existing product line or incremental variations thereof. Before IoT, this product-first strategy could still underpin a viable business because customer data were relatively scarce and the means to gather data were costly and difficult to deploy. Meanwhile, end-user innovation—customers creating their own solutions—was rare. For the most part, only companies whose primary business was moving ones and zeroes—software developers or social networks, for example—had access to relevant data in sufficient volume that the data could drive the evolution of existing products while inspiring new products and services that changed how customers met their needs. And only software companies could spin new iterations of their products on a monthly or even a daily basis. That is no longer the case. While businesses selling desirable low-tech products (artisanal food providers, bespoke bicycle makers) may continue to thrive while remaining detached from IoT, large corporations in fiercely competitive industries must adapt. This is especially true in sectors where adaptive, tech-forward start-ups are overthrowing centuries-old models by approaching their markets from the same point of origin as Zipcar: seeking not to sell a new product into an old market but to reimagine how an underlying need can be met. Also, thanks to the “maker culture” triggered by entities such as Ruby on Rails, Arduino, and MakerBot, end-user innovation has become far more common. We have entered an age of “massively parallel innovation” in which new ideas flow simultaneously from multiple corners of the economy. The consumer’s role in the economy is slowly shifting from consumption to collaboration—and eventually, to creation. Inversion begins with satisfying needs or enhancing experiences. An inverted company sets out to reinvent how its customers meet certain needs or experience part of the world. This removes the limits associated with selling a single product or product line and opens up additional opportunities adjacent to the customer’s need. It’s technologically omnivorous. An inverted company uses all available technology to pursue its defining customer needs, unconstrained by a product line. When a need is identified that falls within its core competence, any available technology or product may be harnessed to meet that need—including offerings of other companies. It’s connected. An inverted company uses its products themselves to generate immediate and fact-based feedback about how well customer needs are met and what unmet needs remain, not unreliable “product research.” And, it uses that same connection to interact in real time with the consumer, becoming an integral and ongoing part of the consumer’s experience. It’s disruptive. An inverted company is prepared to do whatever is necessary to fulfill its vision—even if that means pivoting away from yesterday’s products or abandoning them altogether. What an inverted company cannot do itself, it gets through partnership or acquisition. What these characteristics have in common is that they break through the boundaries of traditional products, and that is where IoT comes in. It is obvious how IoT supports the connectedness needed to directly measure customer experience. How will inversion impact business? Six foundational business ideas have long been approached in the world of product-first business strategy. These are not points of failure, but they are important ideas that inversion (and IoT) is changing—sometimes dramatically. Brand has long been the Holy Grail, particularly for businesses selling mass market consumer products. Traditionally, a brand can be thought of as the collected qualities of a product or service and the promise they communicate to the buyer. Brand is regarded as the linchpin of corporate value, to be safeguarded at all costs. In many ways, the brand is the traditional, pre-IoT product because in the consumer realm companies are as often selling a feeling of belonging, style, or “cool” as they are a physical object with beneficial properties. In many cases, the company brand surpasses the product brand and even lends products a “brand halo,” a feeling of being inherently superior by being associated with the company. An obvious example would be Porsche, an automotive brand whose name and cars, with their distinctive look, feel, and performance, inspire not only loyalty and love, but also a fierce sense of belonging among its drivers (if you’ve ever seen anyone give the “Porsche wave,” you understand what we mean). In the product-first world, brand is closely linked not only with the physical traits and appearance of the product, such as its design and materials, but also to the social and cultural cachet created by marketing. Hence the billions spent each year on brand marketing campaigns to imbue products with ineffable qualities. Competition has long been a simple, Darwinian proposition: every man for himself, and every company in the same sector is an enemy, an acquirer, or a target for acquisition. Companies have clear-cut boundaries where they end and others in the same vertical market begin, and barring a formal partnership or strategic alliance, they work to seize market share from one another. Change happens slowly, at the pace of product rollouts and incremental improvements. There is room for numerous players of various sizes in many markets because customers have limited access to information allowing them to compare the different providers’ weaknesses and strengths. Perhaps most importantly, competitors rarely change (because companies that are dominant in a specific industry tend to limit themselves to that industry), and collaboration is always intentional, never occurring by accident. Innovation is about reimagining not only the solutions to problems but the problems themselves. However, true innovation is rare. Instead, most of the innovation in a product-firstmodel is in name only—subtle, incremental, often surface-level tweaks in existing products. When something takes the world by storm, such as the Sony Walkman or iPod, it’s usually not because it represents anything genuinely novel but because its blend of form factor, marketing, and timing hit the market at just the right moment to be successful. Innovation in services is even rarer, quite simply because there are few truly new human needs that can be identified and met by the tools of the product-first world. Even such innovation as does exist—the field of customer relationship management taken to the mainstream by Salesforce, for example—is more a tech-enabled variation on an old theme than a true innovation. Market share is the primary metric of success in an environment where strict boundaries exist between companies in the same market sector. Each company’s main goal is to expand its market share; when expanded, its goal is to defend that beachhead at all costs, against all enemies, foreign and domestic. One of the most critical aspects of market share is that a business can grow its market share in one of two ways: increasing the size of its market or taking market share from competitors. Most often, in the product-first world, businesses seek to capture market share from competitors because the opportunity cost of expanding their market—for example, opening a network of dealerships to sell cars in developing countries—is simply too great and the barriers too high to be practical. This is one of the clearest concepts in the product-first world. Because the boundaries between organizations are clearly defined and impermeable, so too are the products developed and distributed by each organization its sole property. Services differ only in that they are nonphysical; a web of intellectual property laws protects processes, creative ideas, designs, corporate identities, and even distinctive retail and restaurant designs and customer experiences. Meanwhile, trademark and patent laws drawn clean lines around the physical objects each business produces. In this ecosystem of fixed boundaries, little agility, and low adaptability, value is largely about what a product or a service does. For a motorcycle, value equals how it performs and handles and its reliability. For a motorcycle helmet, value equals comfort, beauty, and durability. With a motorcycle repair shop, value equals the skill of the mechanic and the promptness of the repair. For the network of motorcycle dealers, value equals the frequency and sincerity of its communication with customers and the promptness of its action on issues such as recalls. Notable about this measure of value is the fact that companies rarely, if ever, deliver unexpected value beyond the limits of the product or service. Motorcycle helmets protect the face and eyes from wind and road debris and provide protection for the head in the event of an accident; they do nothing else, and no one expects them to. On occasion, a desirable brand delivers value in the form of social status or an ineffable “cool factor,” but that type of value is fleeting and capricious. IoT changes these six business fundamentals forever. Stay tuned for how. Sanjay Sarma is Vice President for Open Learning and Fret Fort Flowers (1941) and Daniel Fort Flowers (1941) Professor of Mechanical Engineering at MIT. Linda Bernardi is a serial technology entrepreneur and author. Formerly Chief Innovation Officer for IoT and Cloud at IBM, she runs the technology strategy firm StraTerra Partners.